Truth be told, I may never have enough time or energy or know-how to have my own bed and breakfast, and that’s OK. 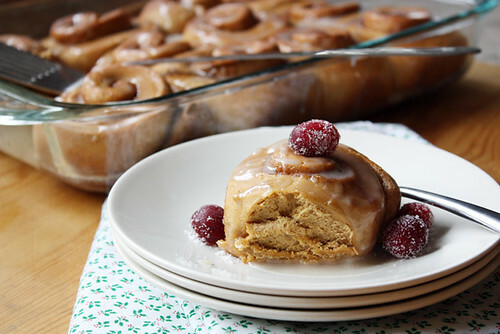 But one thing is for sure — these cinnamon rolls will always be in my (near) future. There’s something about the taste of gingerbread that whisks me away to my childhood. I don’t know if it’s memories of making gingerbread houses with our neighborhood group of kids, or chomping the heads off of gingerbread men around the holidays (such a sweet memory, I know), but one bite of gingerbread and I can’t help but feel all holly jolly inside. Combine that with the coziness of a warm cinnamon roll on a weekend morning and I’m as happy as a kid on Christmas morning. 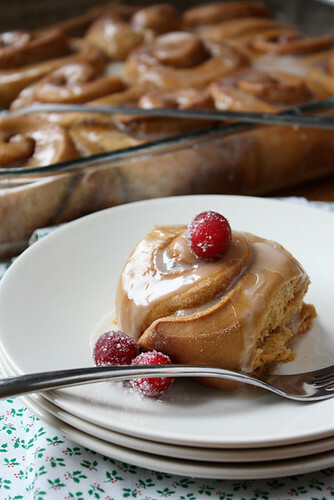 The flavor of gingerbread in these cinnamon rolls is subtle — it sneaks up on you between bites of soft, buttery roll and sweet cinnamon-vanilla glaze. I find they’re best topped with tart sugared cranberries, but the glaze alone is enough to put these over the moon. It’s the perfect recipe to wake up your kids with on Christmas morning (though growing up, my excitement would wake me up well before then) or make for a holiday brunch gathering. Or, maybe, at your imaginary future bed and breakfast. Whatever works. In a large bowl or bowl of a stand mixer fixed with paddle attachment, whisk yeast with 1/4 cup warm water. Let stand 5 minutes. Stir in milk, molasses, brown sugar, egg, oil and salt. Stir in 1 cup flour, then replace paddle attachment with dough hook. Add enough flour until dough pulls away from sides of the bowl (you may not use all the flour). Increase speed to medium and knead for 5 minutes, adding 1 tablespoon flour at a time as necessary until you end up with a smooth, elastic dough (you can also knead by hand on a lightly floured surface for 10 minutes until you end up with a smooth, elastic dough). Shape dough into a ball and place in a large, lightly greased bowl, cover with plastic wrap and let rise until doubled, about 1 hour. Grease a 13-by-9-inch pan and set aside. In a small bowl, whisk together brown sugar, sugar, cinnamon and ginger. Roll dough out into a 12-by-8-inch rectangle and brush melted butter on top of dough. Sprinkle evenly with brown sugar mixture and roll up tightly from the long end, pinching to seal. Cut log into 12 equal pieces and space evenly in 13-by-9-inch pan. Cover and let rise until doubled, about 45 minutes. Preheat oven to 350 degrees F. Uncover risen rolls and bake 20-25 minutes until puffed and golden brown. 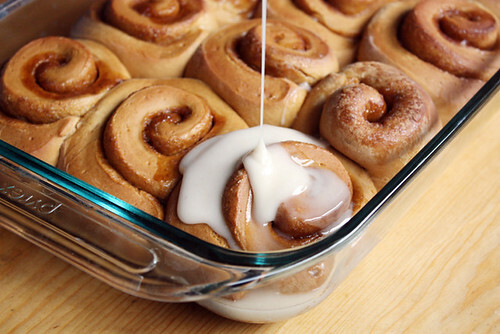 In the meantime, make your glaze: Whisk together powdered sugar, cinnamon, vanilla extract and enough milk to make a drippy glaze. Remove rolls from oven and let cool 5 minutes before drizzling with glaze. Top with frozen cranberries rolled in sugar and serve warm. Um, these are totally amazing. I WANT some!! Must try GF…..hmmm…. These sound so delicious. I make Smitten Kitchen’s Gramercy Tavern Gingerbread every year for Christmas, but I’ve been looking for a way to get more gingerbread into my life! Also, about GF baking, have you ever tried Dolmata flour? It’s a mix that can substitute for AP flour cup for cup, and it includes the xantham gum you’d need. I’ve never tried it in a yeast recipe before, but it words really well with the cakes and cookies I’ve used it for. Kelsey — Thanks for the suggestion! I just might scout out this Dolmata stuff. Can I get it at New Pioneer or Hy-Vee? Ashley — I think you and I are the only ones who will get the salmon puffs reference. Thank your. Bob’s red mill AP-gf baking flour. I am trying it this season for baked gifts. Tom — Thanks for the suggestion! I’ll have to scout that out, too. Dolmata is in the GF section at HyVee. Comes in a 5lb bag for about $13. A little pricey, but I think it’s worth the convenience, especially since I only occasionaly bake GF. I do own a bed and breakfast inn and I am going to make these this next weekend for guests. Thanks for the yummy looking recipe. Can’t wait! Barbara — Yay! Hope you (and your guests) enjoy them! I just made these this morning fora pre-Thanksgiving party, and they were a big hit. Very yummy! The dough didn’t rise very much until they were baked. I used Active dry yeast instead of rapid rise, it was fresh – just purchased yesterday with an expiration date of 2015 – and my water was warm, not hot. Do you think it was a bad package, or did I do something wrong? They rose enough during the baking to be big a good size, but they barely filled the baking dish – not at all like in your picture. I’m new to your blog, but I’m so glad I found it. I made your pumpkin twists and LOVED them. These are even better. Have you done a tutorial on the difference between active and rapid rise yeasts? I should study up. Schnackies — I’ve had that happen to me with rolls sometimes — they just don’t rise very well but the end result is the same. The yeast was probably fine… did you let them rise in a warm place? Sometimes I put the rolls, covered, in my microwave to rise (especially in colder months) so they have somewhere warm to rise. But if the end result was just fine, it’s really no big deal. 🙂 So glad you and your family/friends enjoyed them! This is an older post, so hopefully you still get this! I’m wondering if you think this dough would freeze well. My friends and I want to make these, but want to freeze most of them if it won’t ruin the dough. What if we make the dough, roll and cut out the rolls, freeze, and then defrost as we want to bake them? Thoughts? 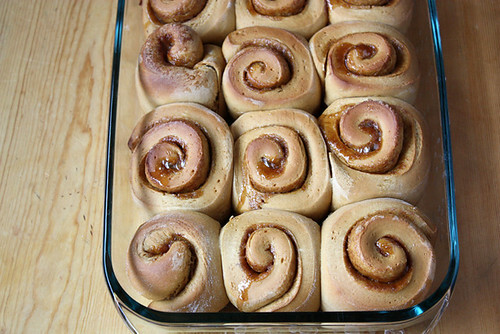 Lindsay — I’ve never frozen these rolls before pre-bake (I’m way too impatient ;)), but here is a great tutorial for how to do so: http://www.thekitchn.com/how-to-freeze-cinnamon-rolls-and-bake-them-later-cooking-lessons-from-the-kitchn-198123. Hope that helps — enjoy!